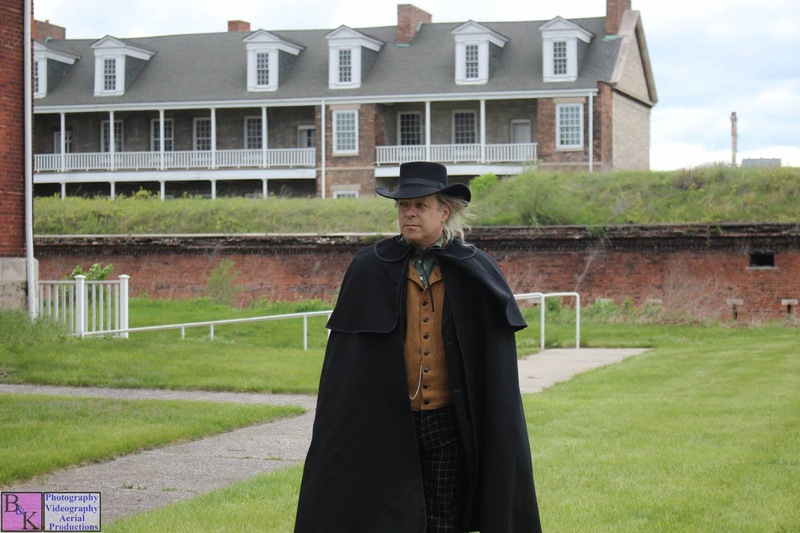 Here we are, once again, at Historic Fort Wayne, an actual mid-19th century fort built in downtown Detroit originally to fend off a possible attack by the British troops in Canada right across the Detroit River. As tensions increased along the Northern border defense that includes new forts from the east coast to the Minnesota Territory, diplomacy intervened. Before any cannon were even procured for the new fort, the United States signed a treaty with Britain that called for diplomatic solutions to their territorial disputes. Because of this new relationship with the Britain and later Canada, Fort Wayne never saw a shot fired in anger. 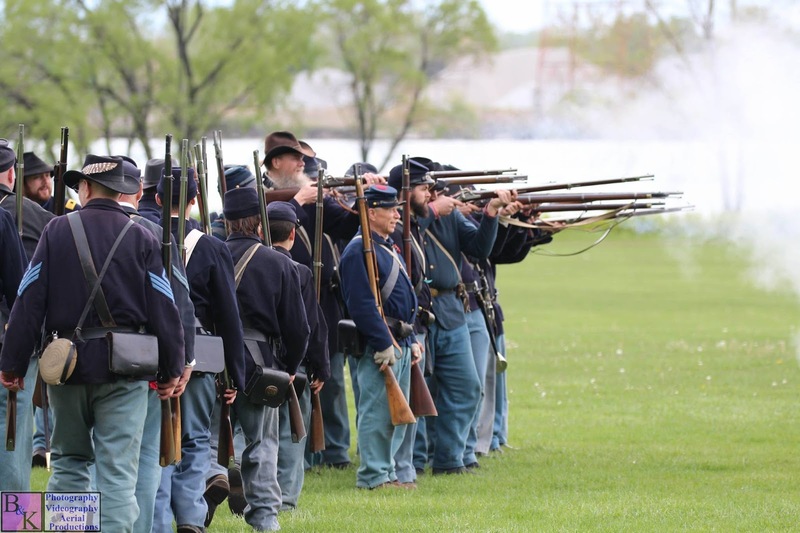 The peaceful location became a primary induction center for Michigan troops entering battle in every U. S. conflict from the Civil War to Vietnam. Among other duties over the course of it’s 175 year use as an Army base, it served as an infantry training station, housed the Chaplin school for a few years, and was the primary procurement location for the vehicles and weapons manufactured in Detroit during both World Wars. Also during WWII the Fort housed prisoners of war from Italy. And now Fort Wayne is a historic site. 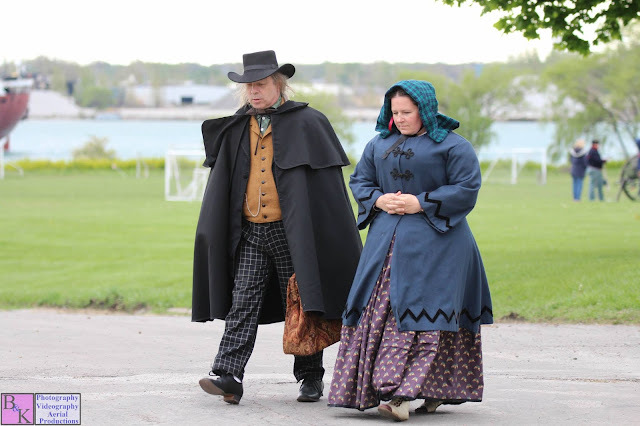 Tours are given, and reenactments of all sorts are held here throughout the year: Civil War, Revolutionary War, World Wars I and II, Vietnam, a Medieval encampment, Christmas at the Fort, Vintage Baseball games, and even night time ghost tours. So...can you guess which three of the above listed events I take part in? Yes, Christmas at the Fort (click HERE to see Christmas 2015), Colonial Days/Rev War (this event takes place in June, so stay tuned), and Civil War Days, which is what this week's posting is highlighting. 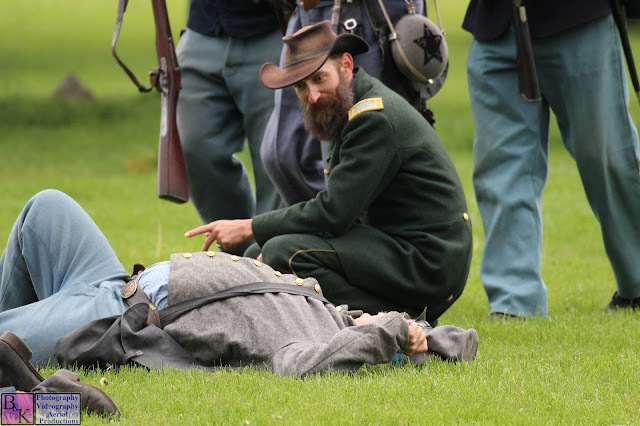 In previous years we have presented the Civil War here at Fort Wayne in September, but that was too soon after school started and many couldn't make it. Before that it was in July, though some say it was too hot to reenact that time of year. Now we're giving May a chance. Unfortunately, mother nature may not be pleased with this date, for we had wind, rain, snow flurries (Sunday), with obviously below normal temperatures. Yeah...not the best weather to travel back in time in. Let's begin with my lovely wife and I. It's pretty rare to see Patty at a reenactment without her spinning wheel, even when we're in a fancy house such as the one here. 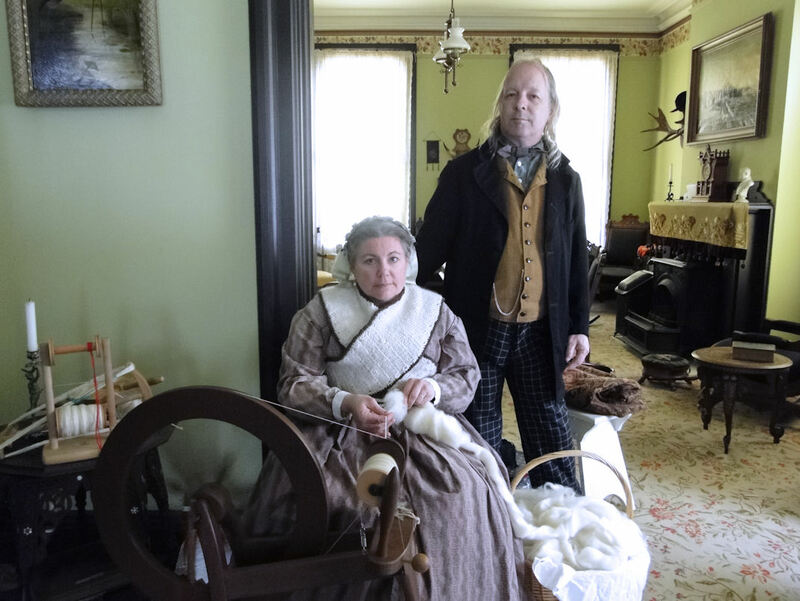 Patty enjoys spinning her wool into yarn almost as much as she enjoys crocheting and knitting. There are times when I'll find her spinning in our back room at 4:00 in the morning because she couldn't sleep and this relaxes her. 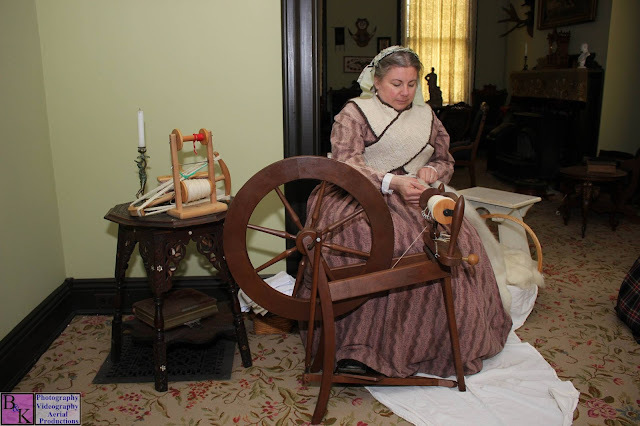 People are always very interested in this ancient craft, and one of the things she loves most about using her spinning wheel at reenactments is giving her presentation to the visitors. The folks here told her they have never seen someone spin "in person" before. 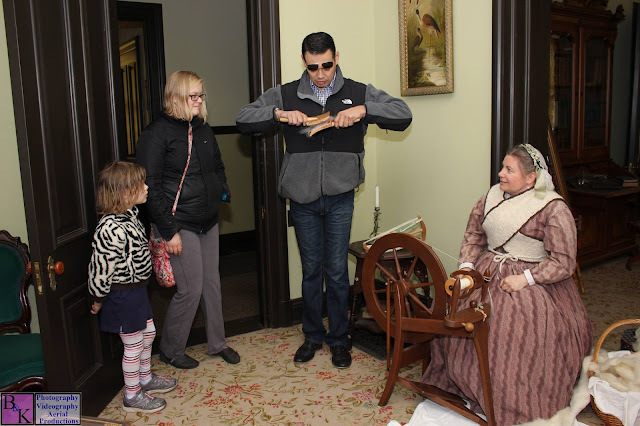 She works interactively with visitors, including (and especially) with the children, and allows them to experience first-hand a few of the different aspects of the spinning process (though here we have an adult who seems very interested). Here are the ladies I do living history with: the three of us work so well together in a family capacity that some folks believe we are who we portray! We didn't necessarily stay in first person while we were at the fort on this day, by the way, but we did keep our conversations based in and around history. What I am most thankful for is that no one brought up any of the modern politics or the modern topsy-turviness of the 21st century. Even though the weather outside was frightful, visiting with friends/family inside was so delightful. 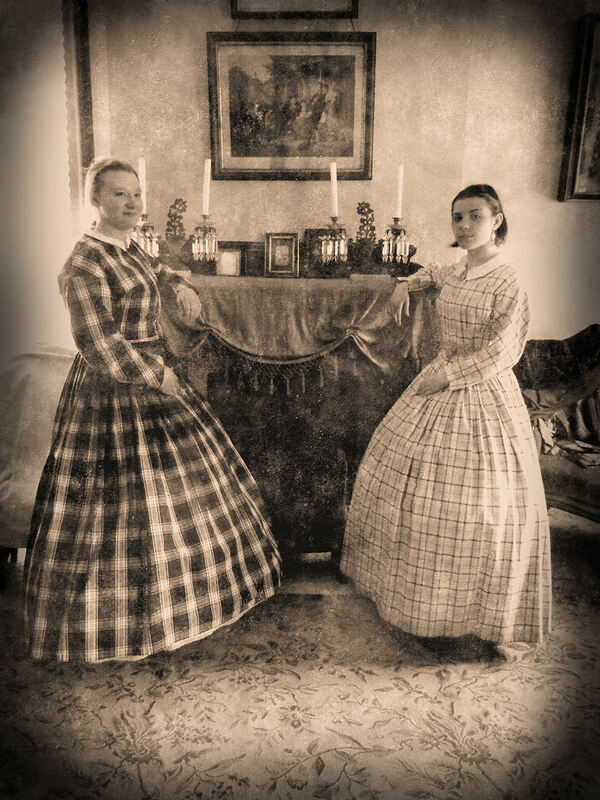 My daughter, on the right, doesn't remember her days before reenacting because she was only two years old when we began in this "hobby," and for her it's something we've always done. In fact, during her days as a kindergartener, she believed Abraham Lincoln was still our President! 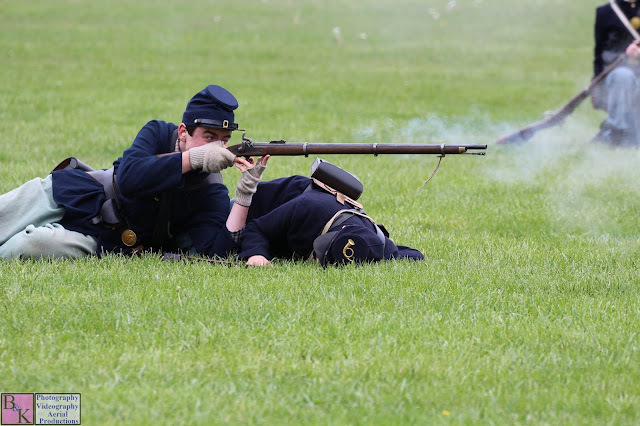 As for the young lady on the left, this reenactment at Fort Wayne was her very first ever. She was so excited and seemed to enjoy herself very much. Battle of Gettysburg in 1863. Good friends always stop by for a visit. 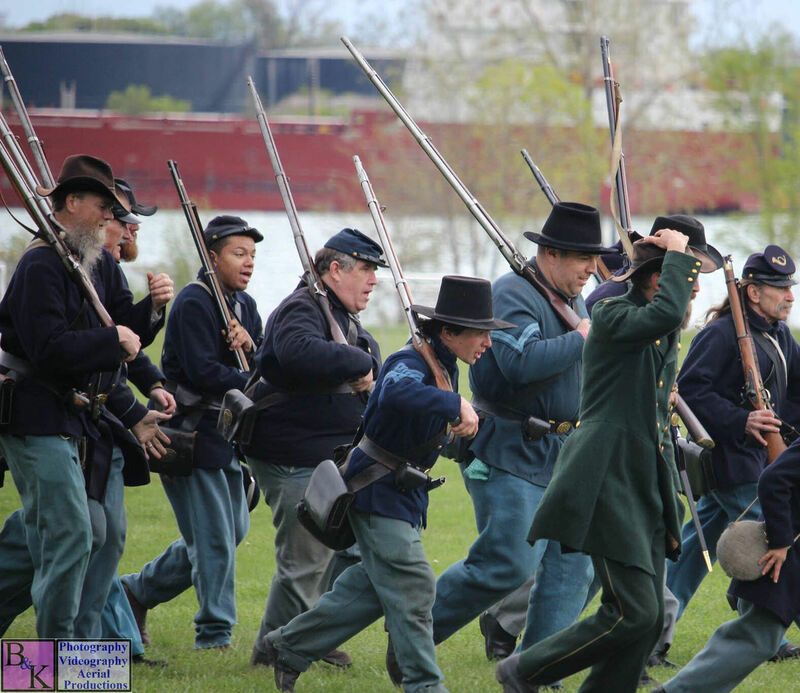 21st Michigan reenacting unit we belong to. Don't let the spot of sun in the previous picture fool you, because the weather, however, was not the best ever, but we never let it prevent us from enjoying ourselves at a reenactment. Larissa and I took a cold walk to the Fort to visit the Union soldiers. 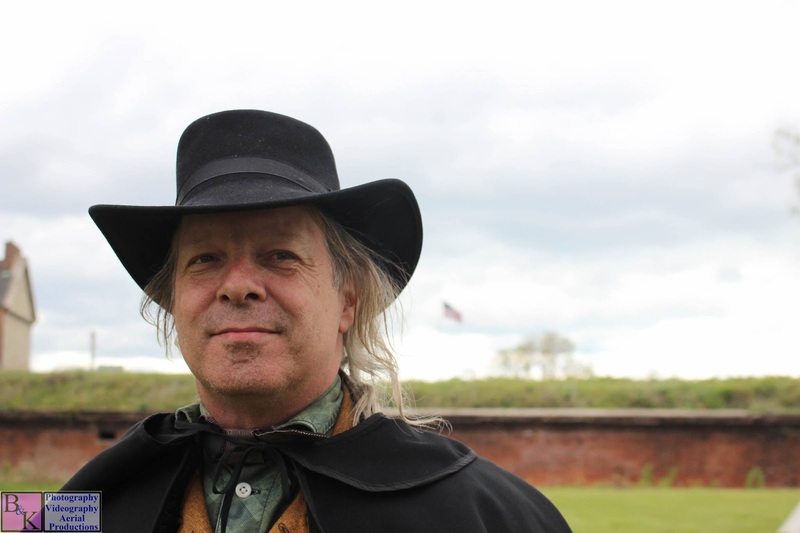 It's pretty rare for me to wear my cloak at a reenactment, except may at October's Wolcott Mill event or at Christmas time. And I certainly never thought I would need it in May! But, with temperatures low enough to give us snow flurries, I'm glad I brought it with me. 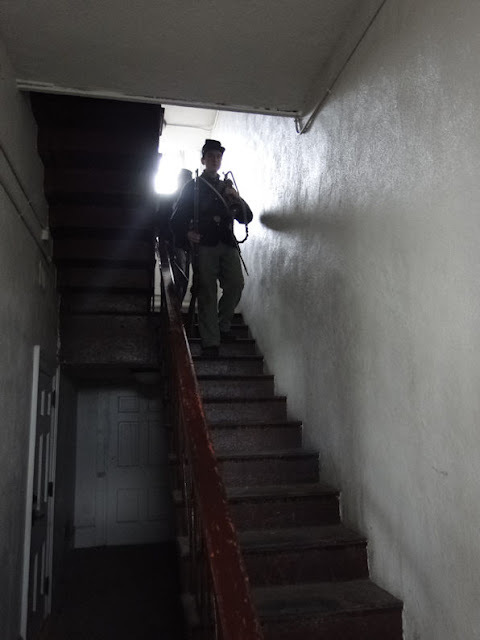 Actually, these men do stay inside the barracks during the reenactments, and in the evening many will keep it all period correct by way of candle and oil light, sometimes playing the songs of the day on fife or guitar, and discussing the war. ...and came down from the upper floors. 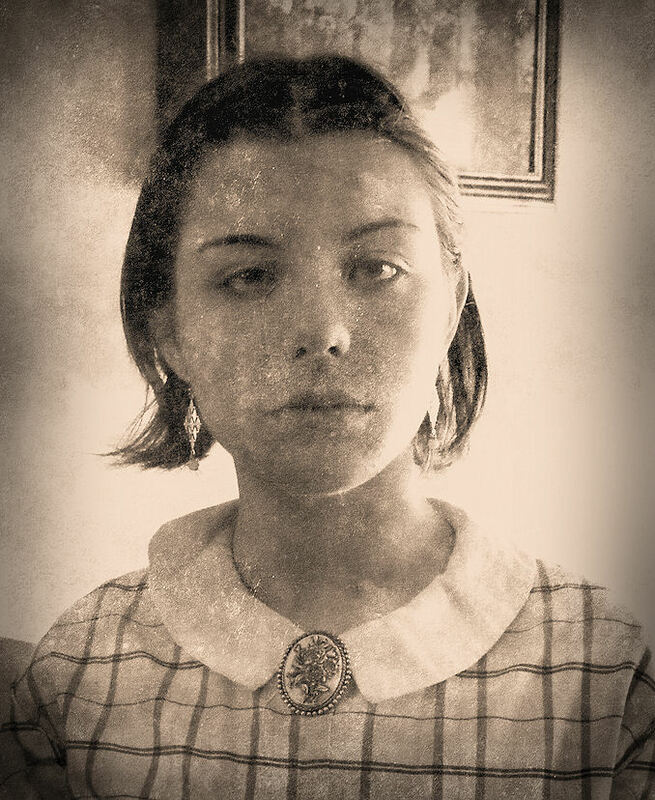 This photo sort of has a haunting feel to it, don't you think? Huh! His name is Jim! Some of the men met outside of the barracks. The battle would begin shortly and they were organizing. This is the very same fort where my father was inducted into the army during WWII. I wish he were alive today to tell me his remembrances of his time here. Formed up and ready for battle. As the boys marched off to battle, the ladies waved goodbyes. As we followed the soldiers out of the star fort, the wind kicked up a bit, as you can see by the ladies' skirts. Before the battle was to begin, Michigan's Governor Blair addressed the soldiers and gave him his blessing to help pull our divided country back together. That's my son their in the middle. Like his father, he takes his living history seriously, as do most of the boys he reenacts with. 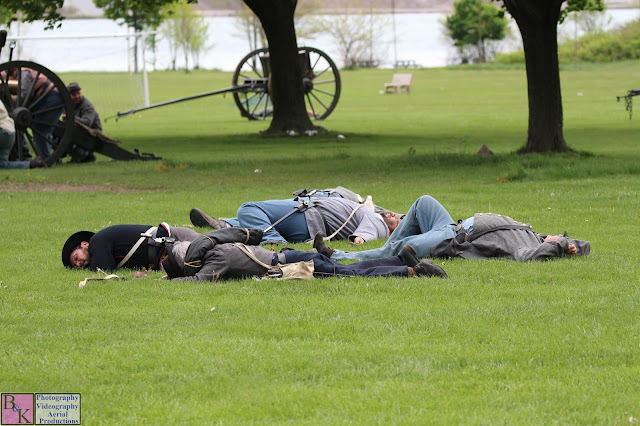 No matter how large or small the reenactment is, the men always give their last full measure to a pleased crowd. When I see something like this going on, especially at a smaller event, it makes me want to stand up and cheer, for it adds so much to the realism of the battle. And, just so you know, the ground was cold and wet. These guys really did give their all, as far as reenactors go. I don't know about you, but something that always drives me crazy is when I hear an announcer proclaiming for the "dead to rise" after a battle has ended. In my mind, that makes a joke out of war and of all those who died fighting. I feel that after the last shot had been fired, the civilians should come out to help the wounded, find a loved one, and cover the dead. That bit of realism is necessary, in my opinion, to show that war is serious business. A possible prisoner of war. It won't be long before this wounded soldier will be off to Elmira prison. My hat is off to the souls who braved the March-like weather as they camped in their tents for the weekend. 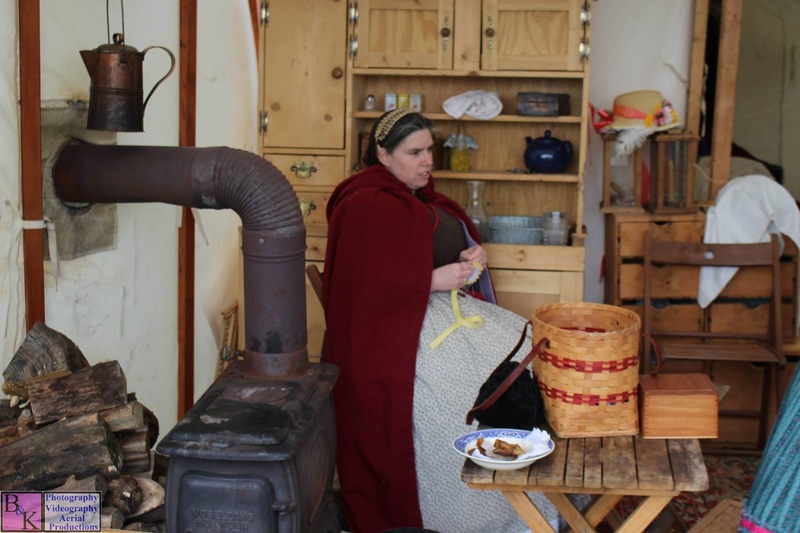 I am glad I live close enough to where I can just go home and sleep in my warm bed, although I know that Sue, here, keeps rather toasty with the wood stove her husband has set up for her in their tent. You know, it felt so good to be wearing period clothing at a reenactment again. 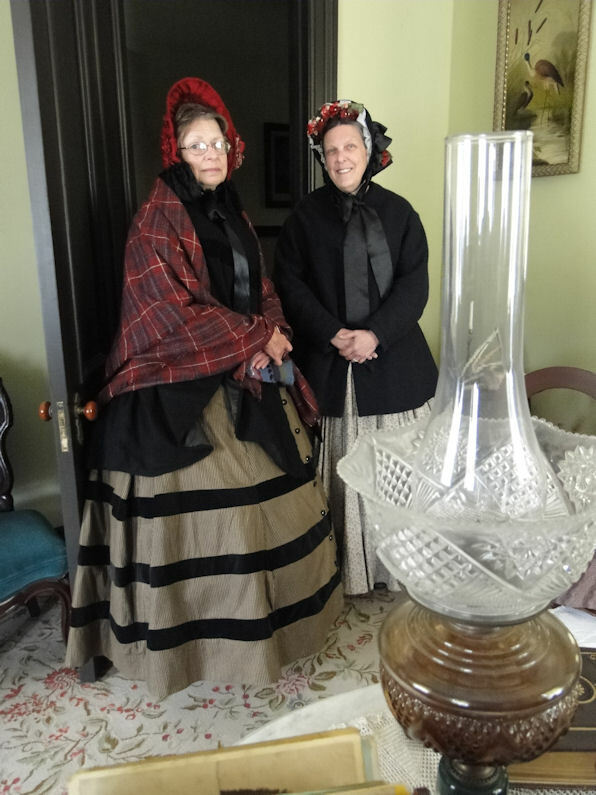 It's been so long for me - since last October's Wolcott Mill event (if we don't count our period dress Christmas celebrations). Wait---I know what you are thinking: "Ken, what the heck are you talking about? We see you in period clothing all the time!" 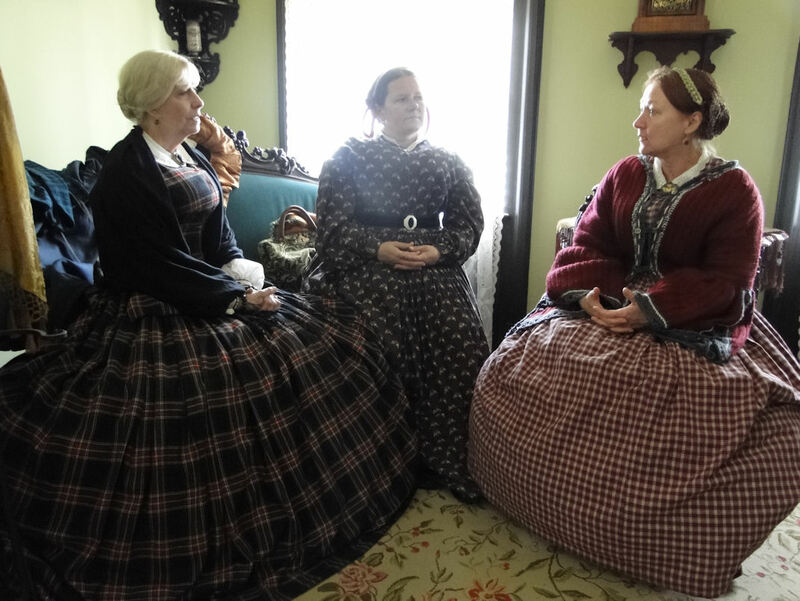 Yes, it's true...I do wear my historical garments quite often during the so-called off months, but it's not quite the same as when they are worn at actual reenactments, you know? 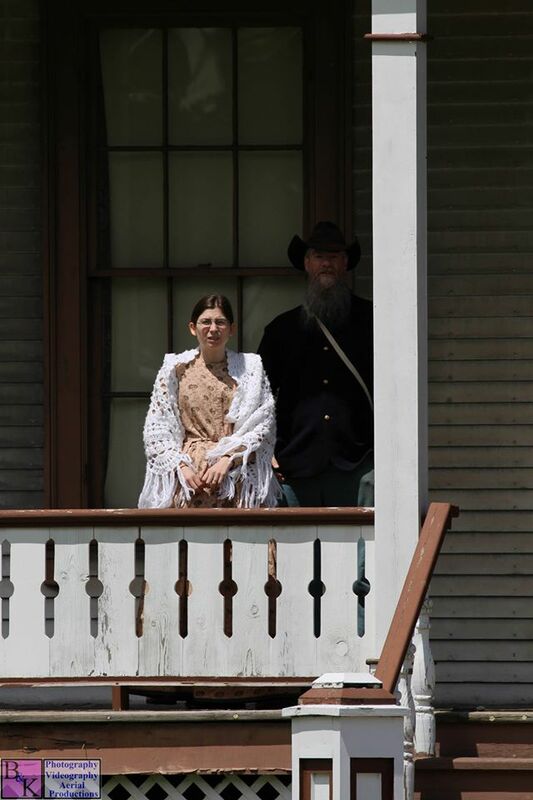 I hope you enjoyed our little time-travel excursion to 1861 at Historic Fort Wayne. It really was a grand time for all of us who participated. In my opinion, if you are with good friends who all have the same passion for the past, then you are at the best event ever no matter what mother nature throws at you. Well, except for maybe a tornado, hurricane, or earthquake. But other than that... don't allow anything to ruin your fine time in the past. That being said, there is one final thought I'd like to mention before I go - - I don’t know about you, but I’m so sick of all of the politics and hateful comments so-called "friends" throw at each other all over Facebook and elsewhere. Can we please keep our political opinions to ourselves while we are at the reenactments this year? If you feel the need to enlighten the rest of us with your insight on who we should vote for, do us a favor---don’t. Reenactments are not the place for it; this is our time to get away from that stuff. PS I am proud to say that we didn't speak of modern politics once during this event. Many of the photos in this weeks posting were taken by my fine photographer friends, Beth and Kevin, of B&K Photography and Video. I appreciate their talent and for the allowance of me to use a few of their pictures here. Yes, only a few - between the two of them they took over 600 photos! Thank God for digital, eh? The rest came from my camera. Til next time, see you in time. Great story of a wonderful event.